If you’re one of the big Ubuntu fans, you might be interested in having a Ubuntu style desktop and applications launch menu on mobile phone. 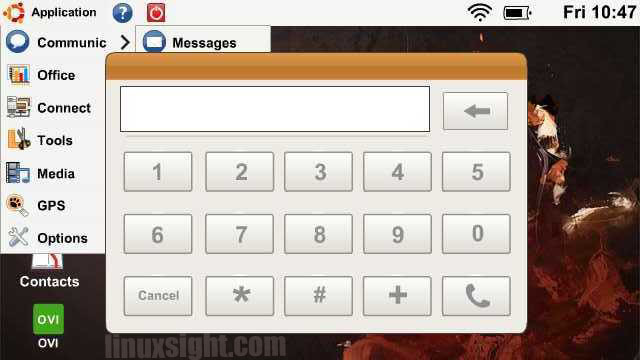 And here’s a nice Ubuntu emulator for Symbian mobile called Mbuntu. Mbuntu runs on following machines(include but not limit to): Nokia C6, X6, N97, N97i, N97mini, 5900XM, 5802, 5802XM, 5800, 5800i, 5530xm, 5230, 5233, 5232, SAMSUNG i8910, I8910 HD, and Sony Ericsson U1i(Satio), U5i(Vivaz), U8i(Vivaz pro). Search and download Mbuntu on store.ovi.com, or just download Mbuntu v1.0 from here. Directly run it on your phone and after that there’s an Ubuntu Logo like app on desktop. No user responded in " Make Nokia Symbian desktop looks like Ubuntu via mbuntu emulator "